So what separates the successes from failures? Expat Marketing talked to Anne Lutgerink, Communications Officer at the Netherlands Organization for Cooperation in International Education (NUFFIC). Anne knows a thing or two about social media—Nuffic’s Facebook page has nearly 15,000 fans. In addition, Nuffic has experimented with other forms of social engagement, like a video contest on YouTube. How does social media complement Nuffic’s overall goals? Our mission is to promote Holland’s “knowledge economy.” Our main activities include capacity building, scholarship promotion and information services, and social media is a good way to exchange information with people who are considering studying in Holland. How did Nuffic get started on Facebook? Nuffic has been around since 1952, but we have only been on Facebook since 2009. We wanted to do was drive more traffic to the website, so we had to identify our target group and how best to deliver information to them. It turned out our target group was mostly on Facebook. What does that target group look like? Our main target group is students deciding where exactly they want to go, who are still in the preparatory stages. They know they want to come to Holland but they need more information. 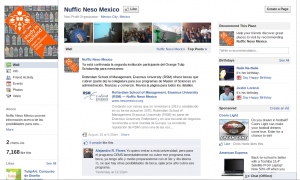 Nuffic’s local offices are spread across 10 countries, and each has its own Facebook page. Given Nuffic is an older organization, did you find you had a ready-made fan base? At first we were surprised how fast it went, but we did do promotions among various institutions. One was a Facebook ad campaign that did well and encouraged people to “Like” the page. Fans go hand in hand with information. You need a fan base, but you also need to be providing useful information. What other benefits did you get through your Facebook presence? What’s nice about a Facebook page is that as you begin following other pages you build up a news feed of the information they are sharing. You can easily see information to share, to like, or to post on your own page. There is an information exchange. You can see this looking at the page now. This helps us work with the other institutions to promote Holland. It fits with other strategies, like the orange ribbon logos we encourage them to use on their websites. 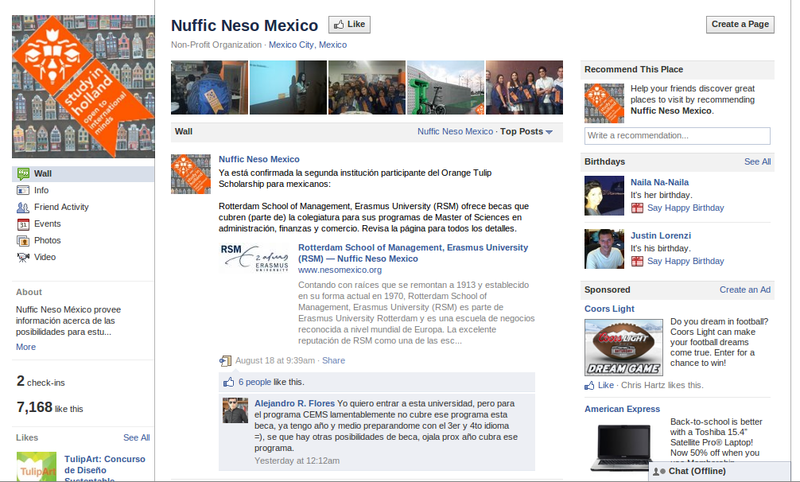 What does Nuffic’s social media presence look like outside Facebook? We are on Twitter, and we also look at the main international portals. We have an office in China, for example, and there’s no Facebook there. So there we use the Chinese equivalent [Ren-Ren]. Can you give us an example of a specific campaign you’ve run? About a year ago we ran a video contest through YouTube, where students could make videos of their experience studying in Holland. We promoted it on Facebook and the website. We wanted to do something new and already had a number of ad campaigns running. With a contest like this there are fewer entries but you get quality over quantity. When it’s over you have promotional materials you can share elsewhere, such as a website or Facebook page. How many entries did you get? We got around 30 entries from international students all over Holland. Any format (video or photos) was fine as long as it was creative. You can view them on YouTube in the Study in Holland playlist. Claudia Jarufe Montagne from Peru won the contest with her video, Discover Holland. Aside from receiving great videos, the contest was also a success in terms of drawing additional attention to our Facebook page. Some of the Dutch institutions also picked up the message and passed it on to their students. What metrics do you use to assess your campaigns? This is always difficult because we’re not an institution that can measure conversions in terms of application volumes. Instead we look at referrals to the website, “Likes” on Facebook, things like that. So having had all this experience, what is your advice to other expat marketers using social media? Learn by doing. We hear from a lot of other organizations that getting on social media is scary, and we tell them just to go after it. It is always a learning process. There are always new opportunities. Just jump in with both feet then? Well, don’t do it because you think “social media is hot, we want to use it.” Know what you want to get out of it, then act accordingly. Anne Lutgerink began working at Nuffic as Communications Officer three years ago, and has since been heavily involved in managing the organization’s online presence. 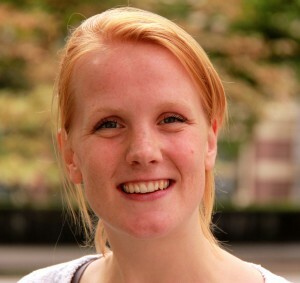 She has a Masters in Communication & Information Services from Tilburg University. Anne can be reached via LinkedIn. Posted in Social Media.Tagged Facebook, Interview, Nuffic, social media, social media contests, YouTube.